Olefins have enjoyed many uses in a wide variety of industries, from car manufacturing to energy production. Energy consuming processes of catalytic dehydrogenation of turning paraffins into olefins has been commercialised since the early 20th century, while catalytic oxydehydrogenation of paraffins to olefins is still in prototype stages. The conflict between kinetic, thermodynamic and yield constraints has delayed the commercialisation of this process. The solution to achieving the relevant process route will be exploitation of the right catalyst at moderate temperatures and pressure. Co5MgAlO is studied under atmospheric pressure and temperatures not exceeding 650â°C, to dehydrogenate C2 to C5 paraffins to olefins using oxygen as a reactant. The ratio between hydrocarbon and oxygen was kept at 1 mole below complete combustion. Mathematical models in relation to practical results where also examined. 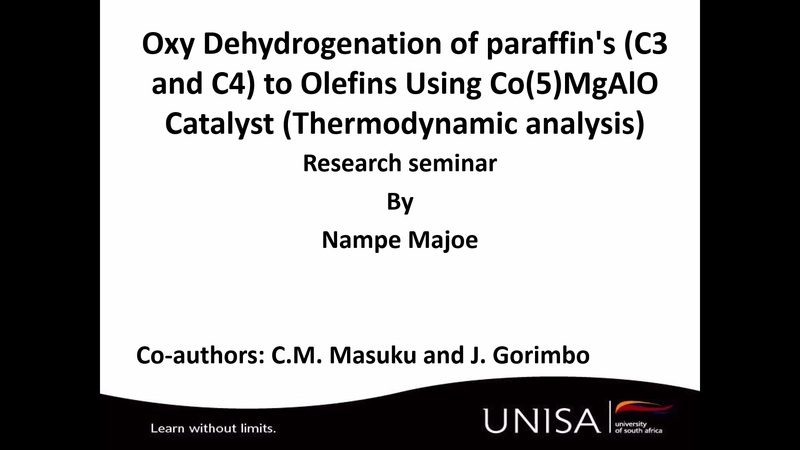 Keywords; Paraffins, Olefins, Mathematical theoretical results, Practical experimental results, Paraffin dehydrogenation, Cobalt(5)MagnesiumAluminiumOxide catalyst.